After reading so many good reviews and seeing awesome swatches of ManGlaze nail polishes, I figured I should try some of them! Mayonnaise was really the reason I wanted to try ManGlaze. Gotta love the name, and the color is awesome too! I have a couple shimmery whites, but this is the only matte one, and also the only one that is an off white instead of stark, bright white. It's as wonderful as I'd hoped, though it took three coats instead of two. This is one I threw in to the order just because it was on sale... and it ended up being my favorite of them all. 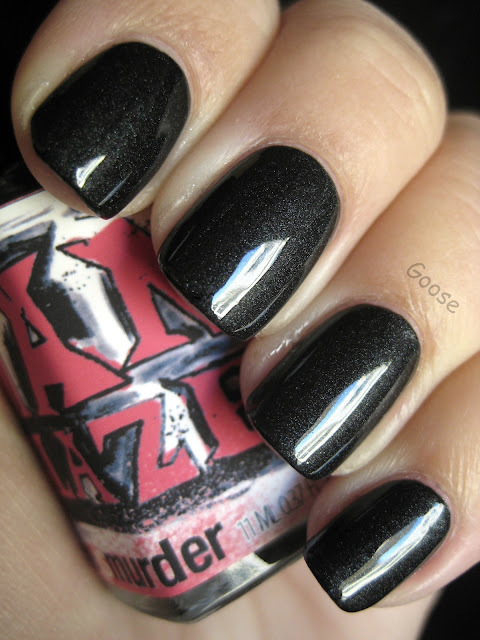 Not only does it look so drab chic matte, but it turns out to be a stunningly edgy gunmetal shimmer with a top coat. I don't know which I like better! Two easy coats. 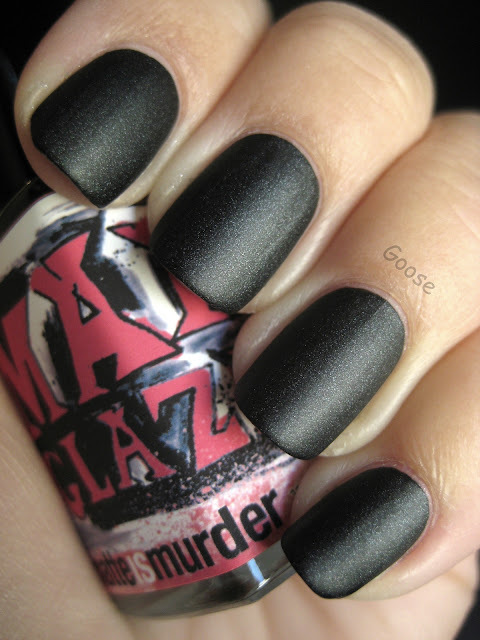 And last is their matte black shimmer: Matte is Murder. This is one of the blackest mattes I've seen, although with a top coat it becomes a lovely charcoal shimmer that has amazing depth. Could be my new favorite black shimmer. Two coats and super easy to apply! All of these can be bought directly from ManGlaze on their website, or from their Amazon store or Facebook store (all three link can be found here). Fuggen Ugly and Matte is Murder are still on sale for $6.66 as of this post! Wow these look awesome! Matte is murder I don't know what I like best matte or top coat! Oh I can't decide! Gorgeous swatches! Still do not own any Manglaze, maybe have to change that someday. Love them, love them all! The same goes for the Zoya's blues and the AA's Meteor Shower - don't want to spam you with a bunch of "oooh, pretty!" comments :D .
So going to order these - look fantastic!!! I love ManGlaze and these look great on you. Definitely do it now! I recommend too, if you haven't picked it up yet, Mink Mittens. Gorgeous lavender matte with silver shimmer. That one converted my manicurist! ManGlaze just has a really fun edge, love the artwork and I almost always get a little extra with my polish. A guitar pick with fun art on it or a decal or something. Sorry I'm commenting about a hundred years late, but I just found your blog!